Pay attention, and you will hear this phrase used very often, especially when people do a service for you. The practice sends a wrong signal, and represents a missed opportunity. Here’s a true story to illustrate why the phrase should be avoided. My wife and I were out to dinner a while ago and ran into a very personable young waiter named Kyle. This young man was still in college, and he was working to earn money and looking for his future. I really liked this waiter because he made great eye contact, and he was polite but not intrusive. For a while I just let it pass and did not think about it, but eventually I recognized that his response was a habit that was undermining his good impression. The statement “No problem” is really not a bad thing to say, but it does represent a missed opportunity to build rapport and trust with the other person. Reason: the statement does not represent a proactive positive response to gratitude. Instead, it reflects a kind of throw-away line that I, the customer, am not that important to him. The effect is very subtle, so the negative impression is not severe, but a more upbeat response, or at least some variety of responses, would work much better. A simple “You’re welcome” would be better than “No problem,” but there could be hundreds of more creative and memorable statements the young man could have used that would further entrench the good impression we had of him. Remember, he has plenty of time to prepare creative comebacks because he pours water for people every day. Another tack might be to demonstrate respect by responding, “I am honored,” or “It’s my pleasure to be of service.” One reader (Timothy Burchfield) commented on my prior article that his employer, Horst Schulze of The Ritz-Carlton, insists that team members use the phrase “My Pleasure.” I love the Ritz Carlton vision: “The Ritz-Carlton inspires life’s most meaningful journeys,” and their motto: “We are Ladies and Gentlemen serving Ladies and Gentlemen.” It has the true ring of respect. The response of “no problem” also effectively closes the exchange and stops conversation. 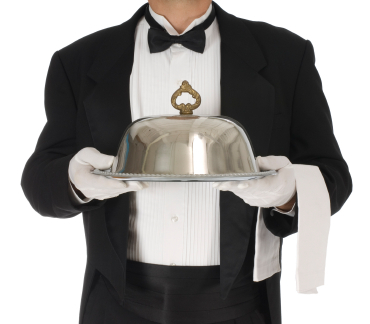 It may be possible to continue the exchange by asking an open ended question when presented with “Thank you.” For example, suppose the waiter had said, “This is special spring water; isn’t it the best tasting water you’ve had for a long time?” That would be a great way to not only differentiate the waiter but also the establishment. The young waiter had to realize that he was serving expensive food to people who could afford it, so every night he was making impressions on people who could potentially influence his life. He was missing some valuable opportunities. I took the time to compliment Kyle on his demeanor and give him some coaching on his habitual response to gratitude. He got the message and was truly thankful for it because he had never given the matter any thought. It was just something he was used to saying. Pay attention, and you will hear this phrase used very often, especially when people do a service for you. The practice sends a wrong signal, and represents a missed opportunity. Here’s an example of why the phrase should be avoided. My wife and I were out to dinner a while ago and ran into a very personable young waiter named Kyle. This young man was still in college, and he was working to earn money and looking for his future. I really liked this waiter because he made great eye contact, and he was polite but not intrusive. He had one annoying habit that was a distraction from the otherwise stellar impression that he created, but he was unaware of the habit. Every time he would do something, like refresh my water, I would say “Thank you,” and he would reply “No problem.” For a while I just let it pass and did not think about it, but eventually I recognized that his response was a habit that was undermining his good impression. The statement “No problem” is really not a bad thing to say, but it does represent a missed opportunity to build rapport and trust with the other person. Reason: the statement does not represent a proactive positive response to gratitude. Instead, it reflects a kind of throw-away line that I, the customer, really do not matter much to him. The effect is very subtle, so the negative impression is not severe, but a more upbeat response or at least some variety of responses would work much better. The young waiter had to realize that he was serving expensive food to people who could afford it, so every night he was making impressions on people who could potentially influence his life. He was missing some valuable opportunities. I took the time to compliment Kyle on his demeanor and give him some coaching on his habitual response to gratitude. He got the message and was truly thankful for it because he had never given the matter any thought. It was just something he was used to saying. You may have the same habit or know someone else who does. My wife and I were out to dinner a while ago and ran into a very personable young waiter named Kyle. This young man was still in college, and he was working to earn money and looking for his future. I really liked this waiter because he made great eye contact, and he was polite but not intrusive. He had one annoying habit that was a distraction from an otherwise stellar impression that he created. Every time he would do something, like refresh my water, I would say “Thank you,” and he would reply “No problem.” For a while I just let it pass and did not think about it, but eventually I recognized that his response habit was hurting the impression he was making of himself. The statement “No problem” is really not a bad thing to say, but it does represent a missed opportunity to build trust with the other person. Reason: the statement does not represent a proactive positive response to gratitude. Instead, it reflects a kind of throw-away line that I, the customer, really did not matter much to him. The effect is very subtle, so the negative impression is not severe, but a more upbeat response or at least some variety of response would work much better. The young waiter, had to realize that he was serving expensive food to people who could afford it, so every night he was making impressions on people who could potentially influence his life. I took the time to compliment Kyle on his demeanor and also give him some coaching on his habitual response to gratitude. He got the message and was truly thankful for it because he had never given the matter any thought. It was just something he was used to saying.